A fabulous gift for your friends this holiday season! Skinny Intern ++ Navoh video collaboration + 20% discount! It's been hard to keep this under wraps, but I have been waiting to share this with you for quite some time now. As some of you may already know, I teamed up with the handbag company, Navoh. And we've been up to some really great stuff! In October, I directed and edited a video for Navoh, a video that will soon be up on their homepage, but all of our lovely readers will get the first look here. I wanted this video to portray the trendy girl in all of us, just going about her daily routine. To celebrate the release of this video, I want to offer you all a chance to purchase your own Navoh bag with a 20% off discount code. Yay! Just use the code "skinny" when you're ready to purchase. Hope you guys like it, let me know what you think! One of my favorite things about the holiday season is the limited edition makeup collections that are now available at Sephora. They're a great way to expand your makeup arsenal, and they make great gifts as well. My current holiday collection that I'm in love with is the All is Bright Lip Glaze Set by Stila. For $25 you get 8 beautiful, glossy shades in easy to apply click pens for a perfect application. This set features 2 of Stila's best-selling shades* and 6 limited-edition holiday shades. 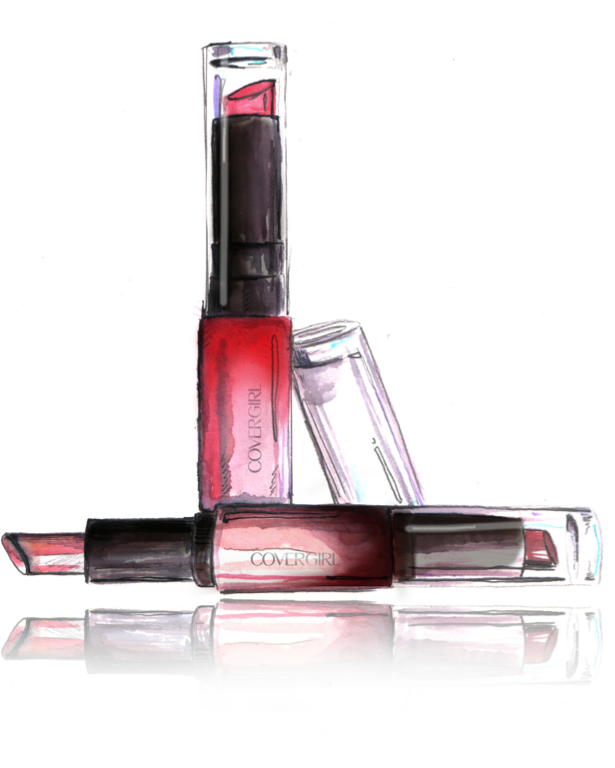 Not only are the glosses festive, but they smell AND taste sweet like ribbons of candy. All is Bright Lip Glaze Set won't be around forever, so get yours soon! I have a new fashion video to share with all of you. This video was shot by my good friend, Julius Gregorio, and edited by yours truly for the designer, Patricia Gomez-Gracia. Let me know what you all think of it... 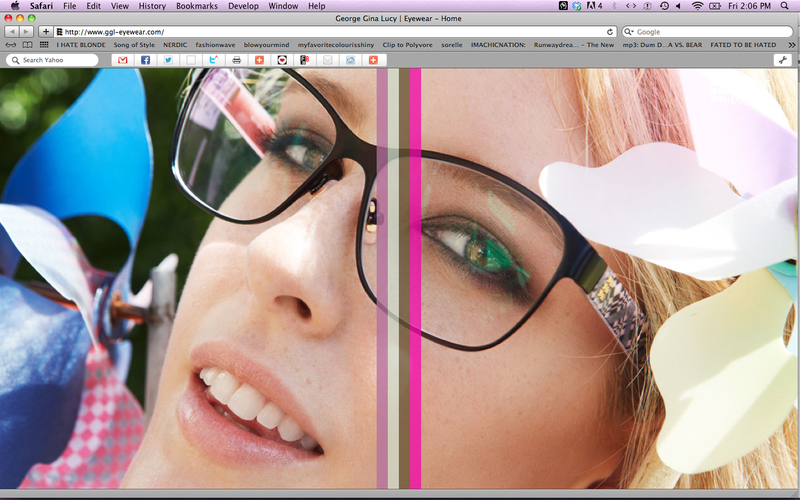 I could use the feedback... positive or negative. It's officially Fall, and the weather shouldn't be the only thing that's changing---your makeup should, too. Here is an easy, every day look that is on trend with the season's hottest styles. Apply foundation and concealer where needed. Top with a light dusting of powder on your t-zone. Apply CoverGirl & Olay Simply Ageless Sculpting Blush in 230 Lush Berry on the apples of your cheeks using a synthetic blush brush, a makeup sponge or your fingers. Apply CoverGirl & Olay Simply Ageless Sculpting Blush in 200 Plush Peach on your cheek bones using a synthetic blush brush, a makeup sponge, or your fingers. 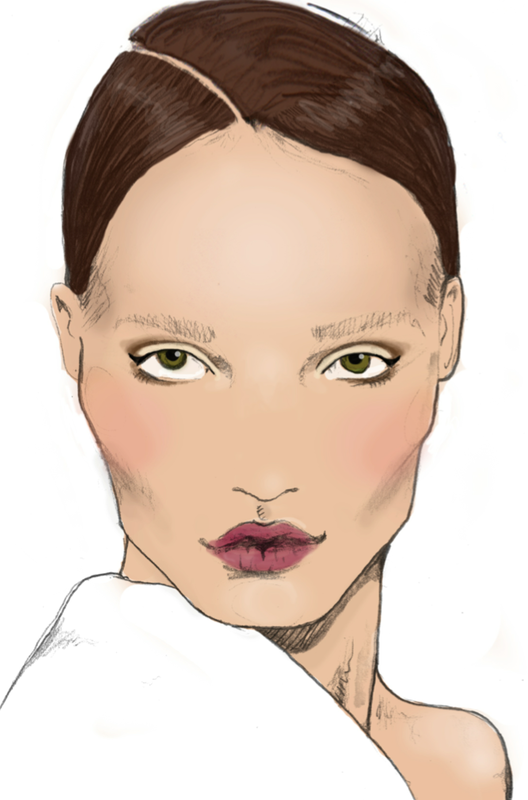 Gently blend the blush using a circular motion. If you are on the oily side, you may add more powder to set the cream blush. I love switching over to cream blushes for the fall because they give a fresh, youthful look. Using CoverGirl Smoky Shadow Blast in Bronze Fire 815, apply Step 1 all over your eyelids and blend upwards slightly above your crease with your fingers or a synthetic brush. 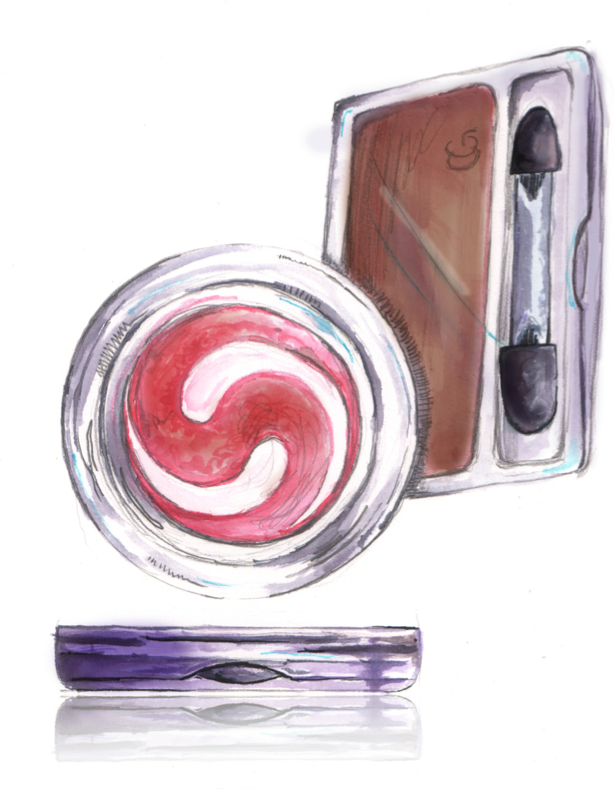 Apply Step 2 in the crease of your eyes and blend with your fingers or a synthetic brush. Apply CoverGirl Queen Collection 1-Kit Eye Shadow in Down to Earth Q120 with a small brush along the outer 1/3 of your lower lash line. Gently smudge with a brush, a cotton swab, or your fingers. Use CoverGirl Intense ShadowBlast in 800 (shimmery snow white color) on the inner corners of your eyes (starlight) to brighten your eyes. Using a liquid eyeliner in black, draw a thin winged line along your upper lash line. 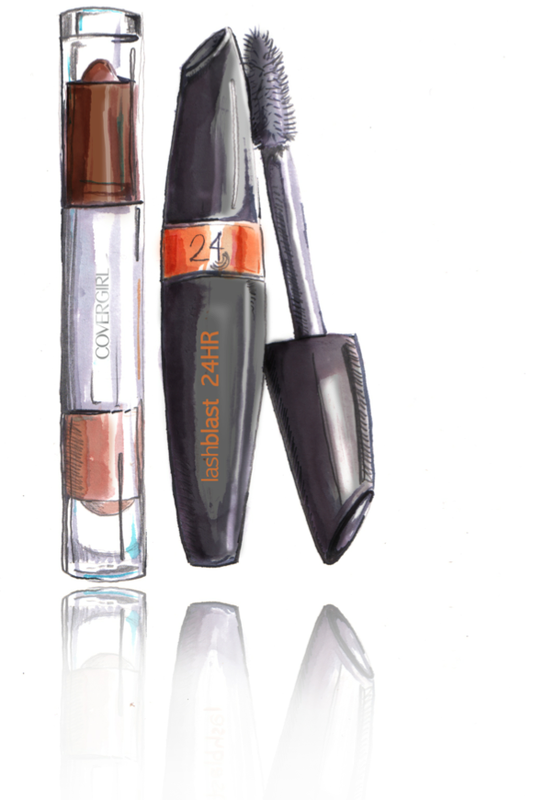 Generously coat your upper and lower lashes with CoverGirl Lash Blast 24 Hour Mascara in Very Black. 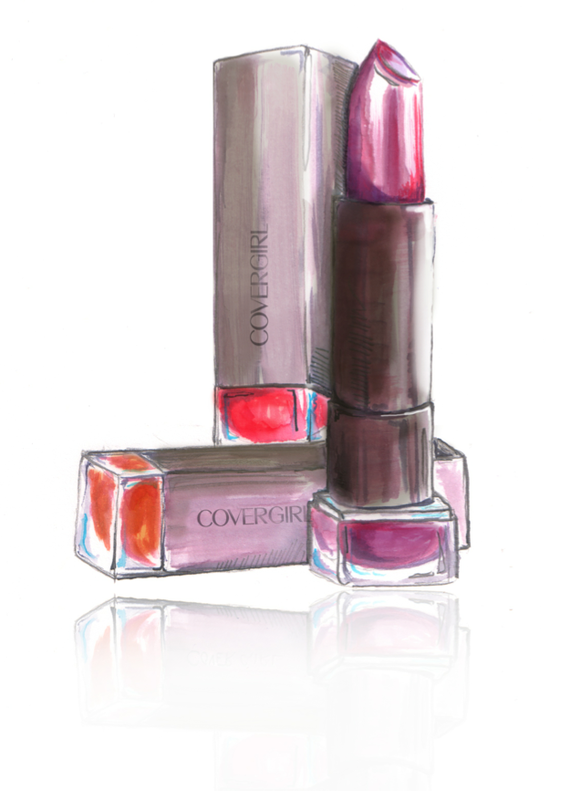 For your lips, mix CoverGirl Lipstick in 360 Euphoria and 255 Delish to make a neutral plum. 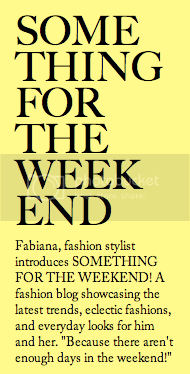 Thank you Natalia Jhete for the designs and illustrations! Just wanted to give you a sneak peak of a shoot that I just did with photographer, Julia Arielle. She is amazing and I can not wait to share the edited photos with you all once they are out. Guess you'll just have to stay tuned, but for now, here's a little something to hold you over. P.s. I am still trying to get all the glitter out of my hair and off of my body, but it was so worth it! Bonadrag.com is my addiction. In love with these Pamela Love-mini pentagram earrings. I fake it so real, I am beyond fake. Ok, I have a confession... I am super excited about the new Courtney Love collection, Never the Bride, that will soon debut on Net-A-Porter.com. Growing up in a very unconventional family, where art and music were heavily encouraged, and report cards were tossed to the trash, I sort of always looked to rockstars and models as my role models. - It's okay, despite the chaotic upbringing, I think I turned out pretty decent. I was always drawn to the darker side, the bad girl side, and the bad girl in Courtney Love has always been a guilty pleasure of mine. Check out a sneak peak of the collection below as it appears in Contributor Magazine. "When Twitter first started, I was mad at someone and I said something on Twitter and got in trouble for it. And then I kept doing it. I think we all agree I am not made for social media... I even get jittery when I go on the internet and I never Google myself. Talk about driving yourself crazy! 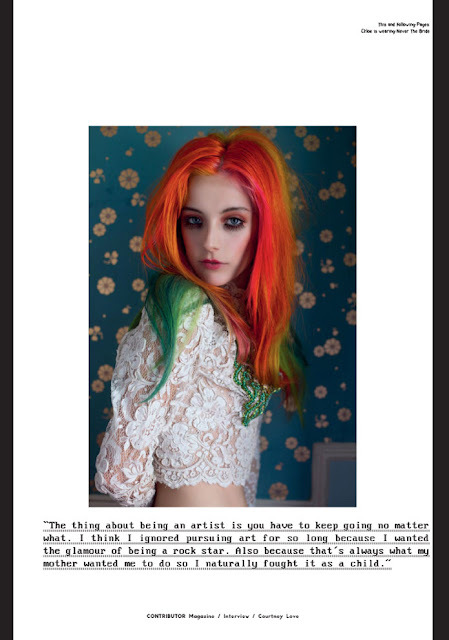 "-Courtney in Contributor Magazine.